After a short, 1/4 mile jog down the red sandy trail, players arrive at Mouse's Tank. 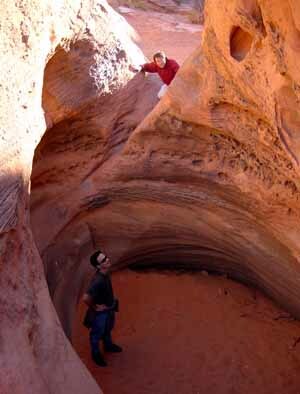 This rock formation is so named for its 15' diameter cylindrical shape, reminiscent of some kind of natural holding tank, with a sandy floor at the base of its 10' depth. It's easy to climb into the tank, but a little bit of a challenge to climb back out-- especially if you aren't a human, and are instead a "mouse"-- well, really, a rat-- who has been waiting inside the tank for game players to rescue you and take you with them. Mouse's Tank delivered not only a traditional envelope clue to each of the team players, but also a new teammate and novel challenge-- Shelby Logan had left behind his old pal, "Templeton" the rat, who carries with him a numerical decryption key which will enable players to infiltrate the chip inside Shelby's brain and begin their disarming attempt. The problem: how could Shelby have hidden a number inside a live rat? Examining the outside of the rat revealed nothing-- so that mystery was left to the players to solve on their own. See "hidden info" page for the answer, and listen carefully to Shelby's A# messages for hints. 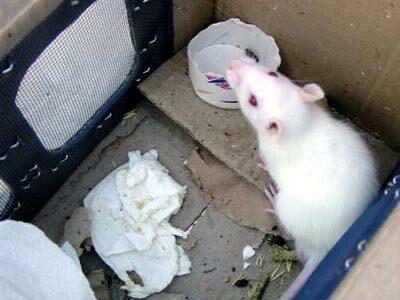 Players were instructed that they must treat Templeton as if he were a friend and teammate, and care for him by creating a nice home for him, feeding him regularly, and by bringing him with them in person to many of the forthcoming clue sites. Templeton's care and feeding instructions explained not only how to keep him comfortable and fed, but also that he really enjoys riding around on people's shoulders. Many of the teams really took this to heart and became great friends with Templeton over the next 18-20 hours. Gold was first to arrive, still before dark. At the time, we had just arrived and were using the "pay for a rat" approach-- this was our method of keeping an eye on the rats and keeping them away from the tourists while the tank was crowded and before we just let them run loose. After the rats were freed they tended to hide in the dark crevasse lower corner, which made for a great glowing eyes effect. Most teams jumped down and grabbed a mouse in this phase, when the rats were still "sleepy". As it got darker the rats began to liven up! They began jumping straight up, about 4 feet high, which made catching them very amusing. As the last teams got there they were having to use their jackets as nets because the rats were able to move so fast and jump so far. It wasn't until the last team (black) that we had collected the rats and were offering them at regular price if they jumped down to catch them, or a slightly higher price for our wrangling and catching of the rat on their behalf. About half the teams thought it was the coolest thing. The others were very interested in the cost of the minimum bribe necessary for us to give them one of our boxes (which we NEVER did). When the rats were loosed in the tank we discovered that nearly all of the tourists found it irresistible to take a picture because it was so unbelievable that there were mice in mouse's tank! One French visitor even jumped in to see if they were friendly and ended up with one on each shoulder. Also, we found that the rats amazingly could scale the walls of the tank and were even able to hang up side down for extended periods of time. This meant that we had to stay on on Templeton-sitting duty to make sure they didn't go for a swim in the next tank. Special thanks to the Valley of Fire for granting us a permit to use the park after dark and to "distribute" our well-cared-for animals here.